The blooms of the iris bring a rainbow of color to our landscape in the spring. This official cultivated flower of the State of Tennessee is popular across all the regions. Photo by A. Pulte, courtesy UTIA. In Greek mythology, Iris was the goddess of the rainbow; she was a messenger who brought an arc of color to the sky. In our gardens, the blooms of the iris bring a rainbow of color to our landscape. It doesn’t matter if you live on a country road or on a downtown street; iris are plants that catch your eye when in bloom. For most of Tennessee and the Mid-South this begins in April and persists through May with other iris blooming later in the season. By mid-April, the largest flush of bearded iris flowers are what is taking center stage in most gardens. There are 200-plus species of iris including some North American natives. Species are separated into two main groups - rhizomatous and bulbous. Bulbous irises form a more typical bulb and include Persian, reticulate and many dwarf irises. Rhizomes are underground stems that grow horizontally and are used as storage for the plant. 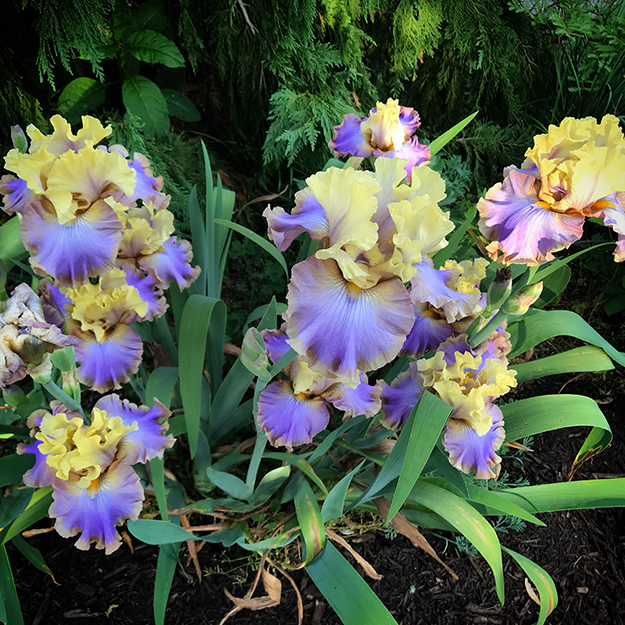 Bearded iris falls into this group as do both the Japanese and Siberian iris. The Iris, genus Iridaceae, is the official state cultivated flower of Tennessee. While iris come in several different colors, and the act naming the iris as the state flower did not name a particular color. However, by common acceptance, the purple iris is considered the state cultivated flower. If you love and enjoy iris you may consider having a secession of iris bloom in your garden comprised of several different species. This could begin with Iris reticulata a small bulbus iris, followed by a dwarf bearded iris like ‘little sighs.’ Next, add classic tall bearded iris to your garden. There are many to choose from, ‘Team Player’ and ‘Gypsy Lord’ are two of my favorites. Follow this up with a Siberian iris like ‘Caesar’s Brother’ and Iris tectorum, the Japanese roof iris. If you like iris, why not get involved with one of the many iris societies we have right here in Tennessee? These can be great ways to meet new gardening friends, share knowledge and gain insight into gardening in your specific region of the state. There are iris societies in neighboring states as well. To get more information, simply search the internet for any of these iris gardening groups. Or visit the website of the American Iris Society at www.irises.org.